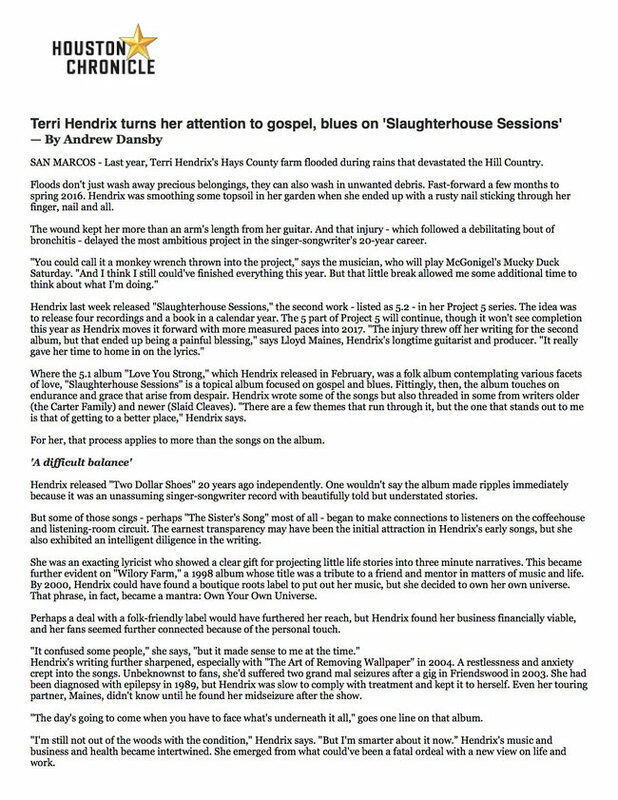 WELCOME - Terri Hendrix: Human. 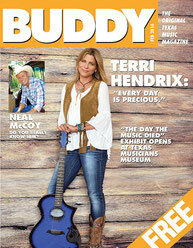 You better believe Terri Hendrix can feel the time — every waking minute of her day, and probably even in her sleep. 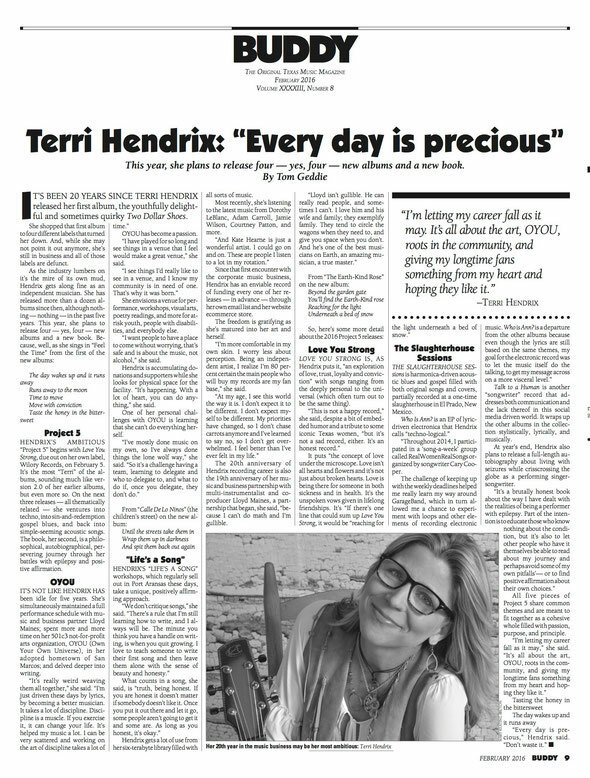 Seven years ago, she wrote a song called “Slow Down” that quickly became a fan favorite at her live shows and even netted her a glowing review from music legend Al Kooper, and maybe someday the pioneering independent artist will make good on her promise to herself to do just that. But first she’s got a marathon to finish and a dream to build, and neither time nor life is gonna just sit around and wait for her to catch up. 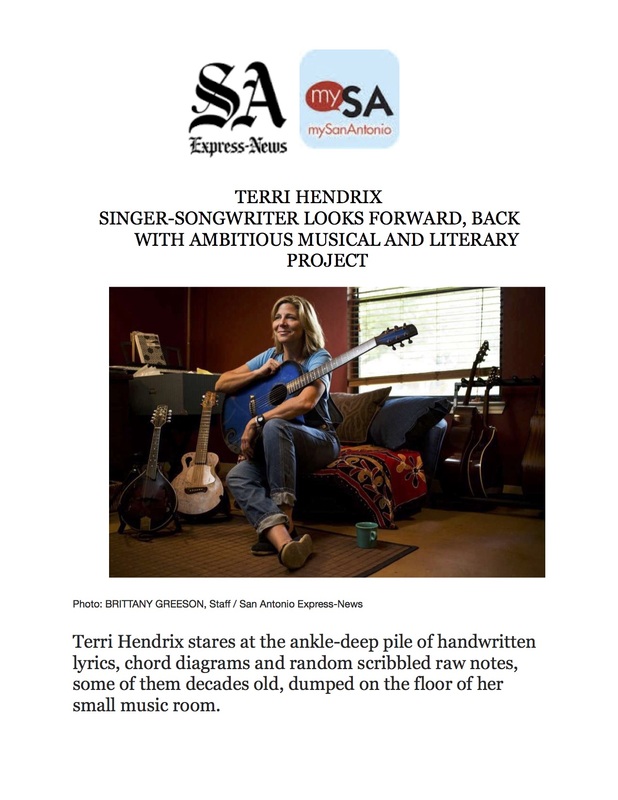 Hendrix calls the marathon “Project 5,” and it’s one that the award-winning singer-songwriter has been training for her entire career. 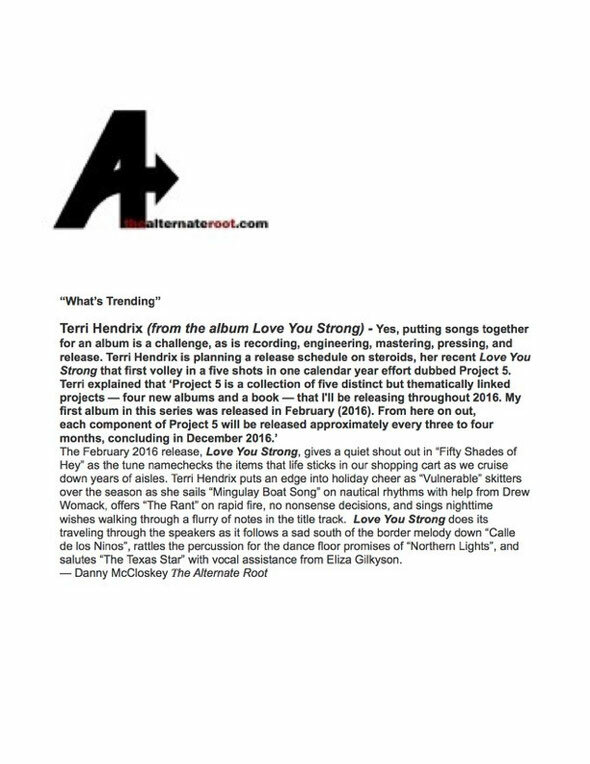 At a glance, it’s a comprehensive collection of lyrics, music, and hard-earned, firsthand life lessons addressing the topics of love, loyalty, friendship, faith, and resilience over the span of four new albums and a book. Each element is a distinct project unto itself, but they’re meant to fit together like pieces in a puzzle to reveal one big picture. 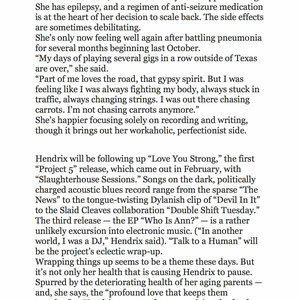 It’s a daunting undertaking, to be sure, but for Hendrix — once described by writer Holy Gleason in No Depression as “a classic Texas texture: tough enough to never fold, strong enough to cut her own path, woman enough to smile in the face of fate and keep going” — the sheer scope of it all has been positively liberating. 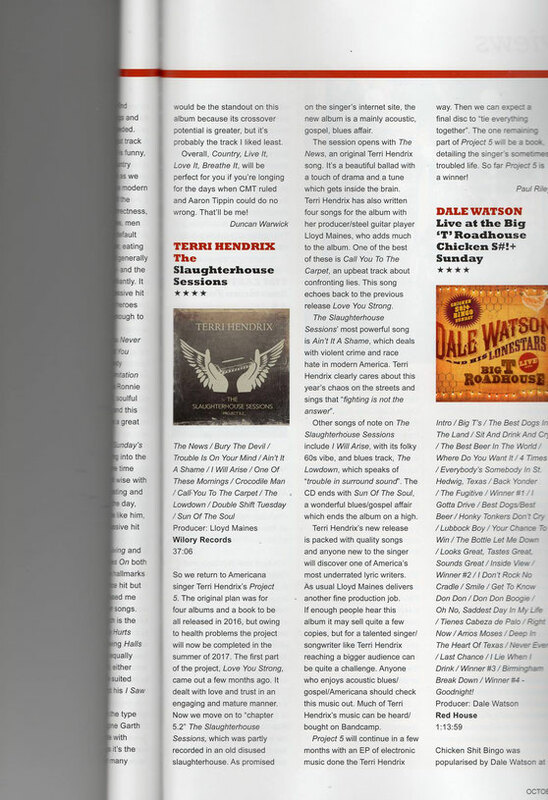 “Seeing that ‘big picture’ allowed me the freedom to explore different aspects of my writing and music in more depth than I ever have before on a single record,” she says. 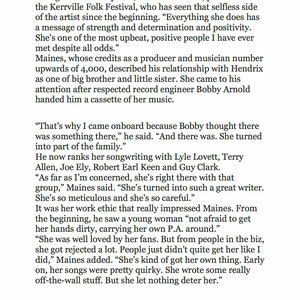 Indeed, it’s the kind of widescreen canvas few artists in her field ever have the opportunity to “paint” on — but having worked tirelessly at owning her own universe for better of part of three decades, Hendrix has earned it. 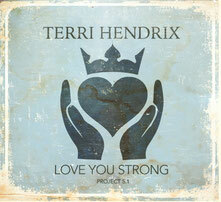 Hendrix released the first two albums in Project 5 — “Love You Strong” and “The Slaughterhouse Sessions” — last year, with the final three pieces all due out before the end of 2017. 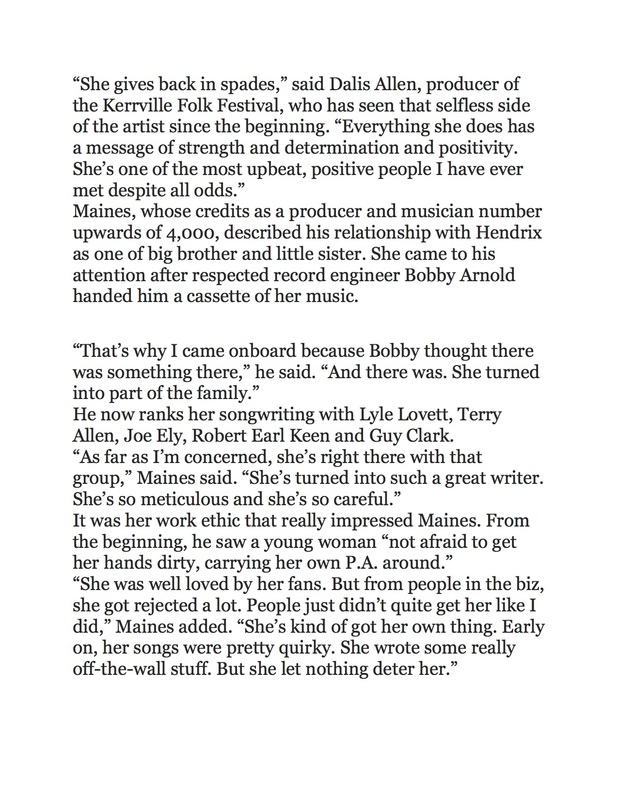 “Own Your Own Universe,” meanwhile, has bloomed of late into something far bigger than just Hendrix’s personal mission statement in regards to her music career. 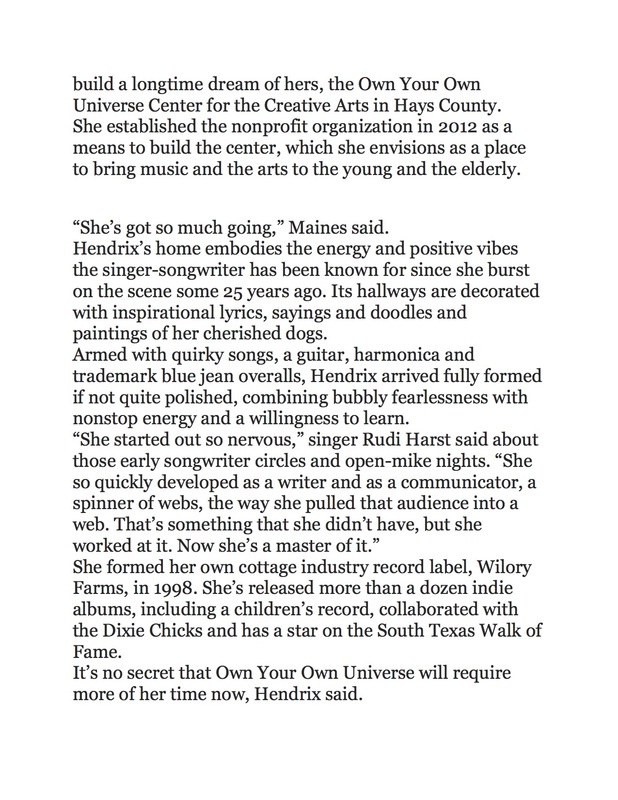 What was once just a means to a dream has become, literally, a dream come true: the OYOU (www.ownyourownuniverse.org), a 501 C3 non-profit center for the creative arts in the San Antonio native’s beloved adopted hometown of San Marcos, Texas. 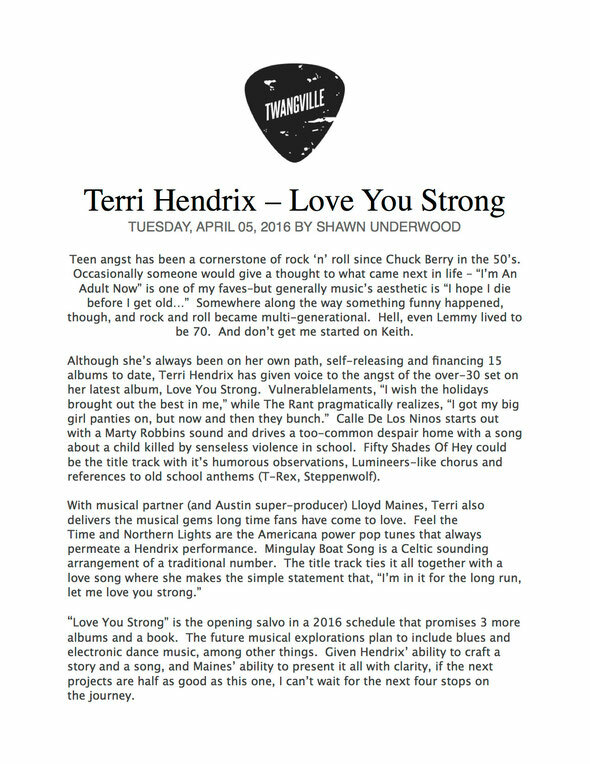 Together with a dedicated team of volunteers, Hendrix has spent the better part of the last decade getting that dream up and running, not just with concerts, workshops, and support groups at the center’s current base of operations at San Marcos’ Quail Creek Country Club, but as a mobile nonprofit on wheels providing music and other charitable services across Texas and beyond. 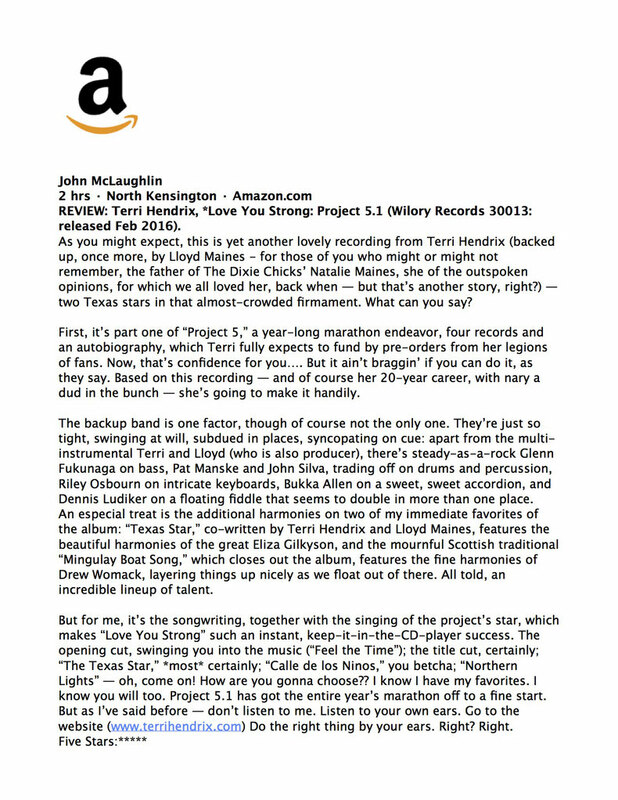 Coming six years after her previous release, 2010’s “Cry Till You Laugh” — an atypically long time for an artist who until then had averaged an album a year ever since her 1996 debut, “Two Dollar Shoes” — “Love You Strong” (aka Project 5.1) served notice from the get-go that Hendrix was determined to leave her comfort zone in the dust. 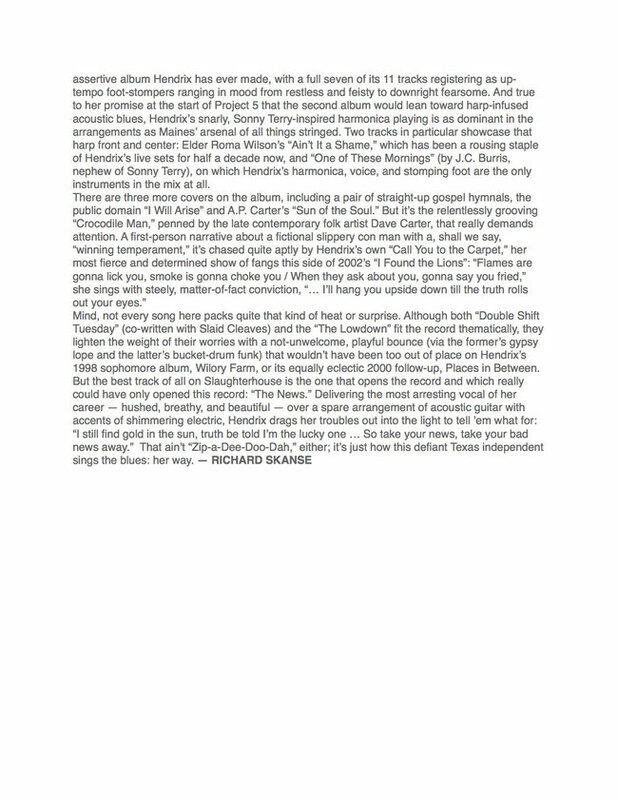 The album takes the topic of love and puts it under the microscope, zooming in with unflinching focus to explore issues of trust, loyalty, friendship, and fortitude both emotional and spiritual — and what it reveals isn’t always necessarily reassuring. The opening “Feel the Time” surges with conviction over an urgent Celtic groove, but tempers its “move with a mission” message with a bittersweet reminder that we’re all on a collision course with mortality. 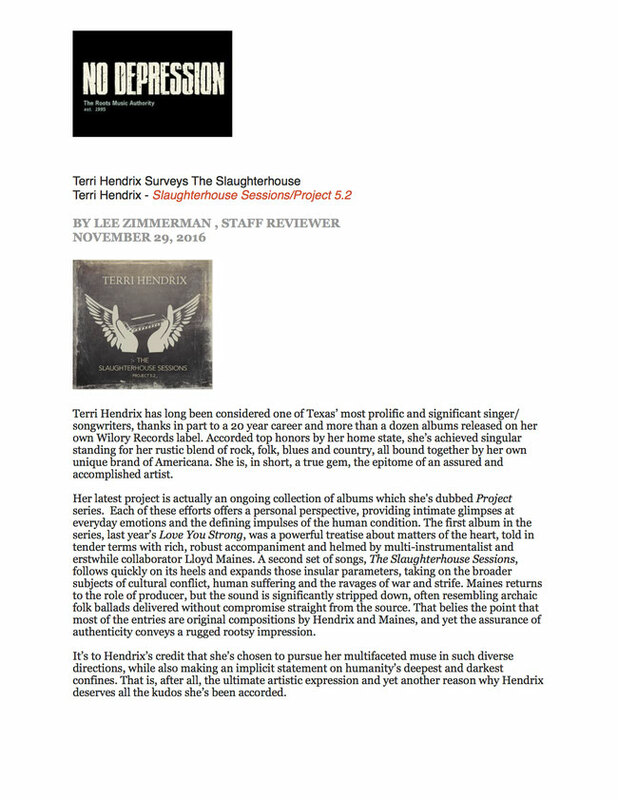 In the deliberately unsettling “Vulnerable,” Hendrix lays bare her most intimate insecurities, and the deceptively peppy “The Rant” is a powder keg of raw nerves. 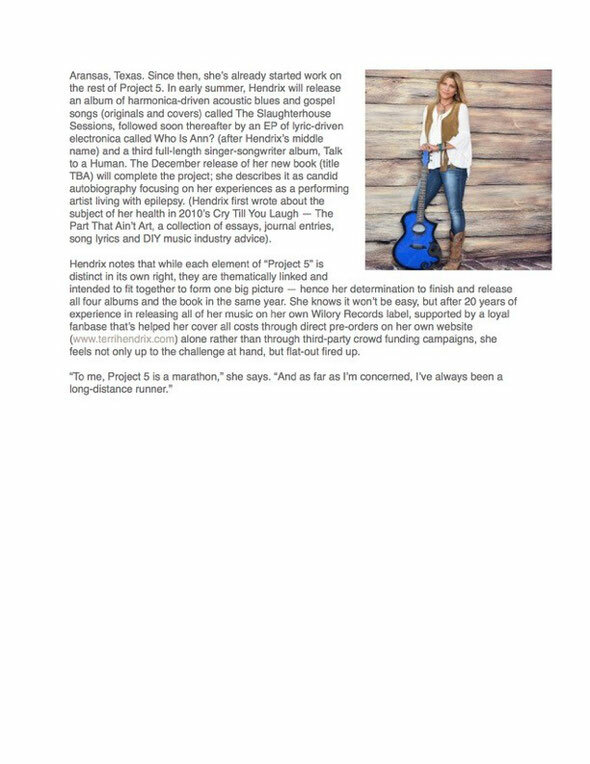 But true to life, there’s hope here, too, with songs like the title track, “Earth-Kind Rose,” “The Texas Star,” “Found” and “Fifty Shades of Hey” all celebrating the kind of beauty that stems from devotion, dignity, inner-strength, and when all else fails, irreverence. 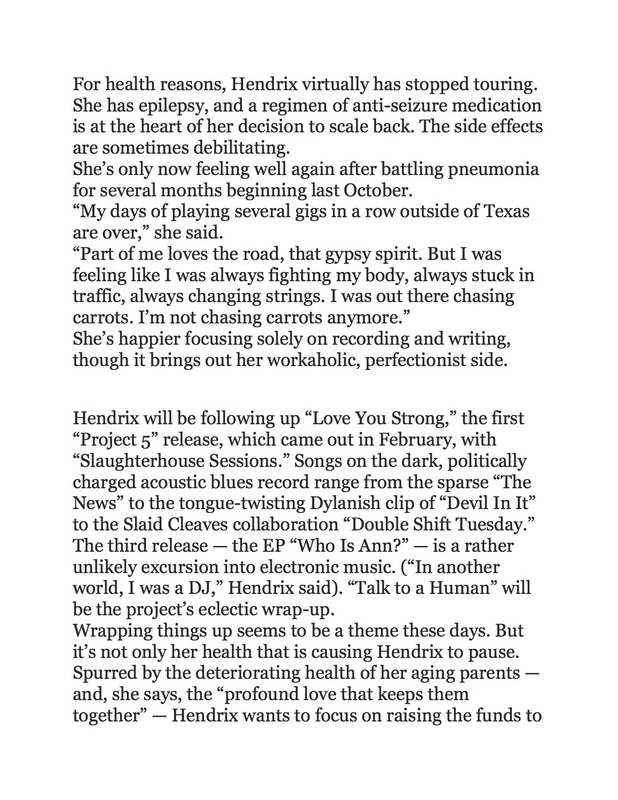 “It’s not about defeat,” insists Hendrix, who has lived with a seizure disorder for most of her life. 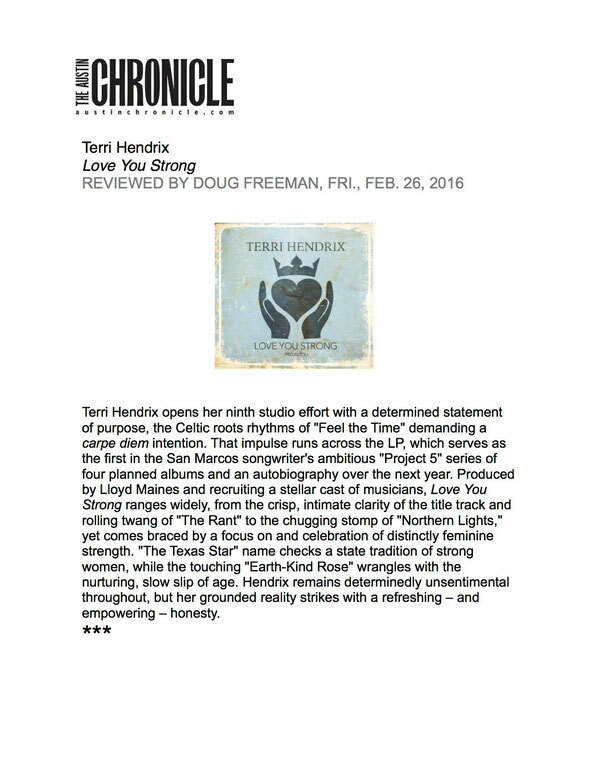 “It’s about courage — and the beauty of not only finding it in oneself, but sharing it with others.” The Austin Chronicle’s Doug Freeman noted that Hendrix’s “grounded reality strikes with a refreshing — and empowering — honesty,” while Andrew Dansby, writing for LoneStarMusicMagazine.com, called the album a “profound and strong statement” — and an “encouragingly strong start” for the rest of the series to come. 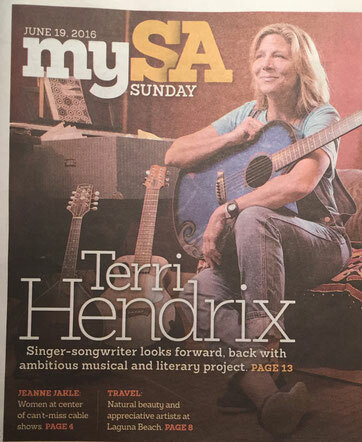 So how’s Hendrix gonna follow that? Rest assured, she’s on the case. 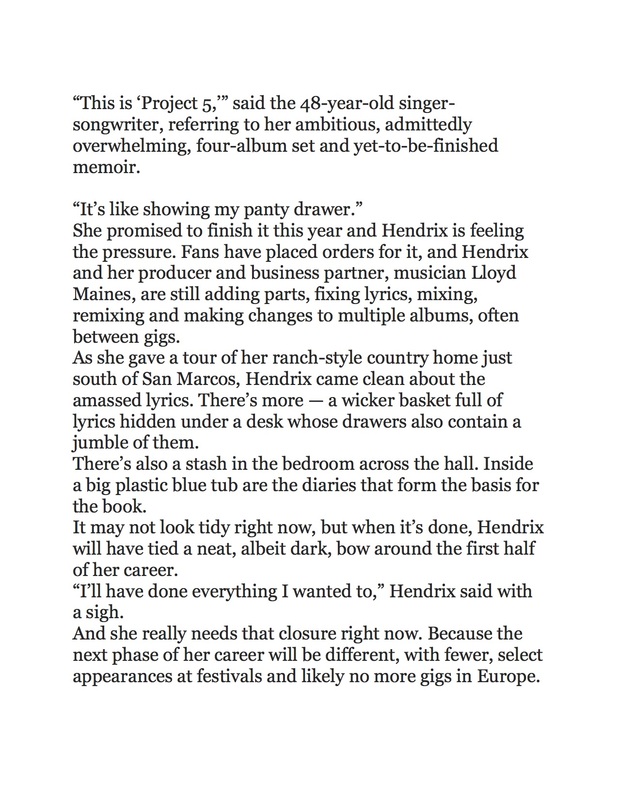 “I am back in my home studio writing, rewriting, recording, and laying down some production on the remaining two albums,” Hendrix said in mid-January, referring to the forthcoming “Who Is Ann?” and “Talk to a Human.” The former, which appropriately borrows Hendrix’s middle name being that it falls smack in the middle of Project 5, promises to be unlike anything that even the songwriter’s most loyal fans have ever heard from her before: It’s an EP-length exploration into electronica, a genre that happens to be one of Hendrix’s personal musical obsessions. 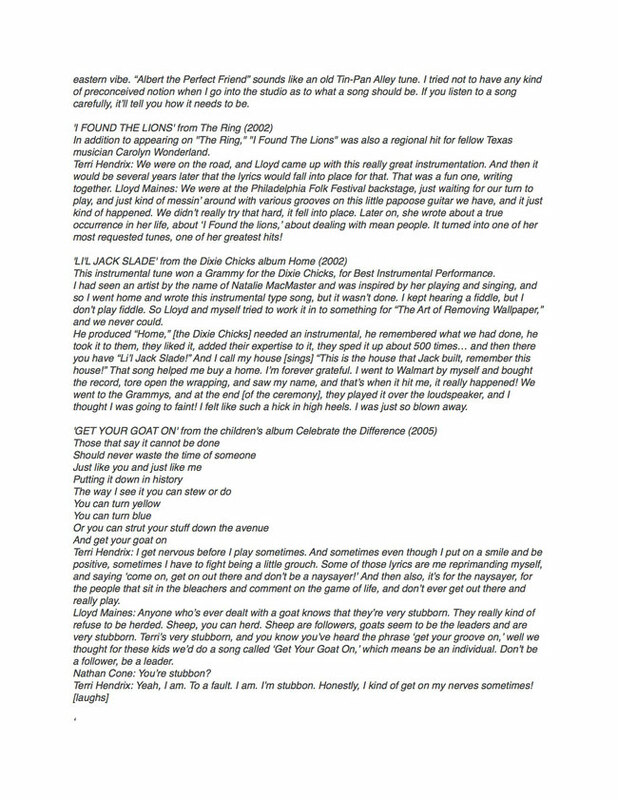 Although she’s incorporated teasing glimpses of her “closet tech-head” side in her recordings before (most recently on “Slaughterhouse Sessions,” as heard in “Bury the Devil”), “Who Is Ann?” embraces it head on. 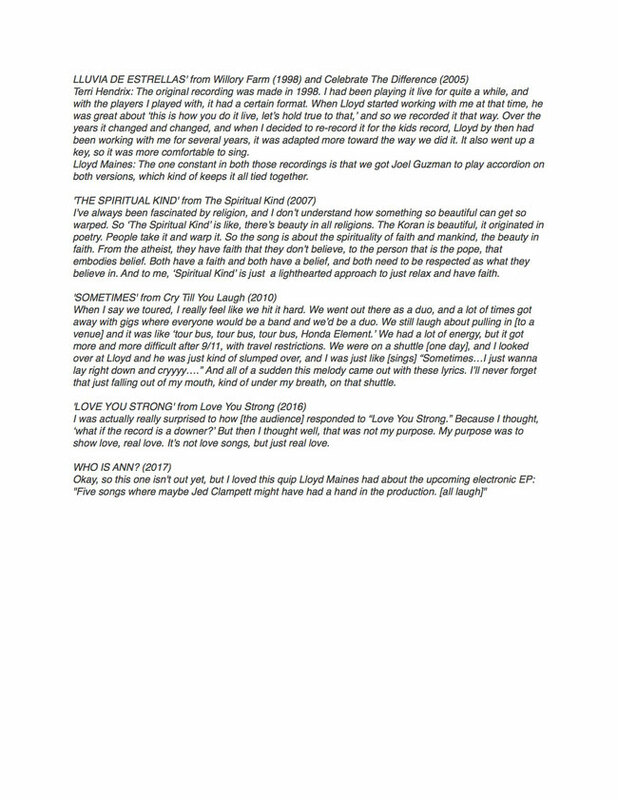 Astute listeners will still hear the recurring themes of Project 5 running underneath the dense waves of looped sounds, drums, and “field recordings” of TV preachers and politicians, but Hendrix says her intent behind the “music on top of the lyrics” approach is to get the message across “on a more visceral level.” By stark contrast, the following “Talk to a Human” will bring the lyrics back to the foreground, with Hendrix directing her focus on the way we connect with each other in a social-media-driven world. 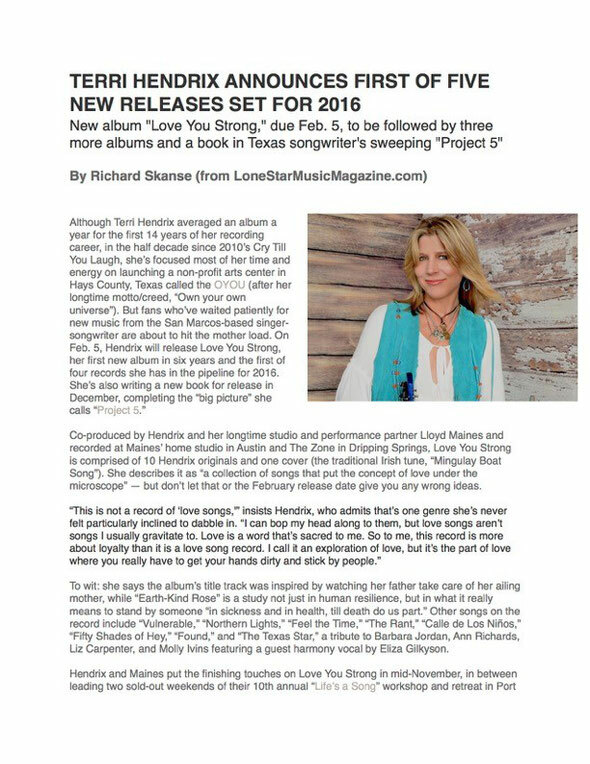 Although she has yet to set a release date for the last three pieces of Project 5, Hendrix is determined to have it all done this year. Being her own label boss, she’s always reserved the right to set her own deadlines, but the sooner she crosses that finishing line, the sooner she can move on to even bigger challenges — first and foremost being the securing of permanent land for the OYOU. For the last year, the non-profit has operated out of its temporary home at Quail Creek Country Club; that’s where the OYOU held its second “Playing for Good” benefit in January, as well as a number of different music and songwriting workshops, this winter’s Snowbird Concert Series, and a monthly support group for people living with epilepsy. 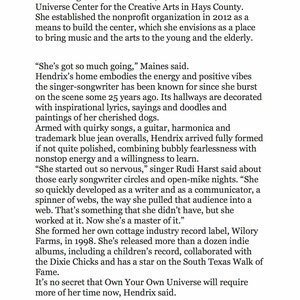 But Hendrix has always aimed for the OYOU to ultimately have its own plot of land, and most important of all, its own fully handicapped-accessible building — a true all-ages community arts center to give back to the city that she’s called home now for more than half her life. 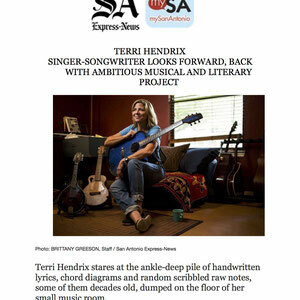 Because even though the 2015 inductee into the San Marcos Women’s Hall of Fame insists that she’ll always write and play music, she also knows that that’s only part of the work she’s meant to do in the time she still has ahead of her. 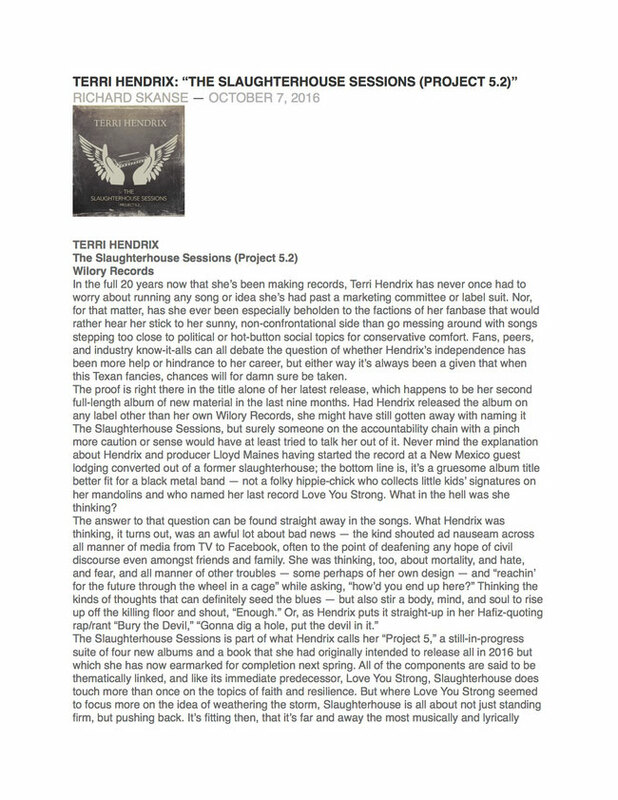 The 2nd album in the Project 5 series. 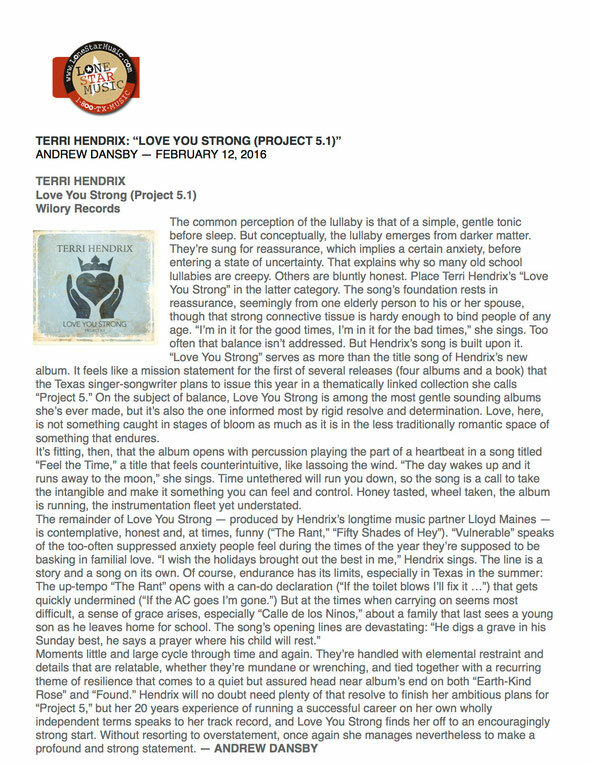 The 1st album in the Project 5 series. 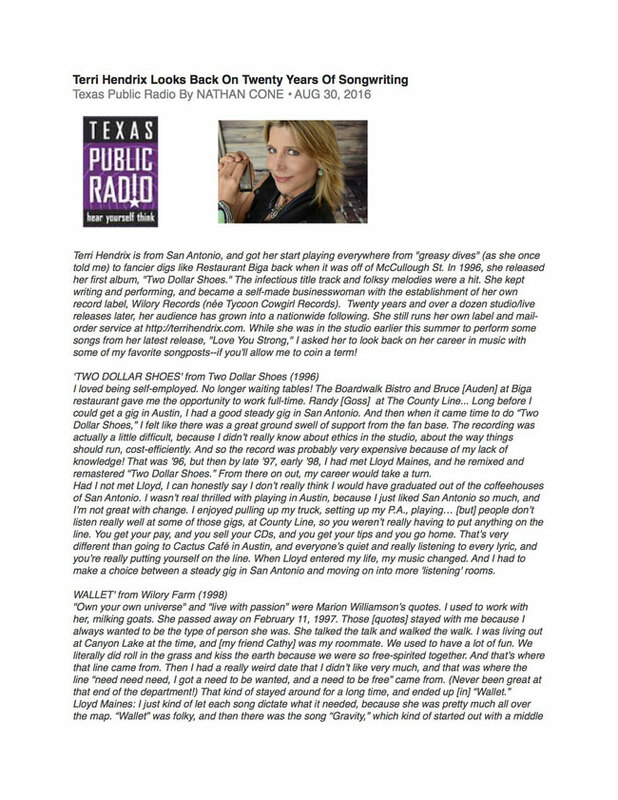 "It takes an almost brutally honest songwriter to say “I wish the holidays brought out the best in me, these days are hard to spend with my family.” There’s a lot of variety, The Rant is frankly self-assertive (“I’d bet on me to win if I were you”), Texas Star, with Eliza Gilkyson harmonies, celebrates Ann Richards, Barbara Jordan, Molly Ivens and Liz Carpenter, Calle De Los Niños describes the funeral of a Mexican child lost to violence, Fifty Shades Of Hey showcases Hendrix’s sense of humor and Mingulay Boat Song is an arrangement of a 30s Gaelic song, but I keep circling back to the sensational title track, “I wish you could trust me, I wish you could lose your doubt, the second-guessing I could do without.” If she keeps this standard up for the next three albums, Project 5 will be a landmark in Texas music." 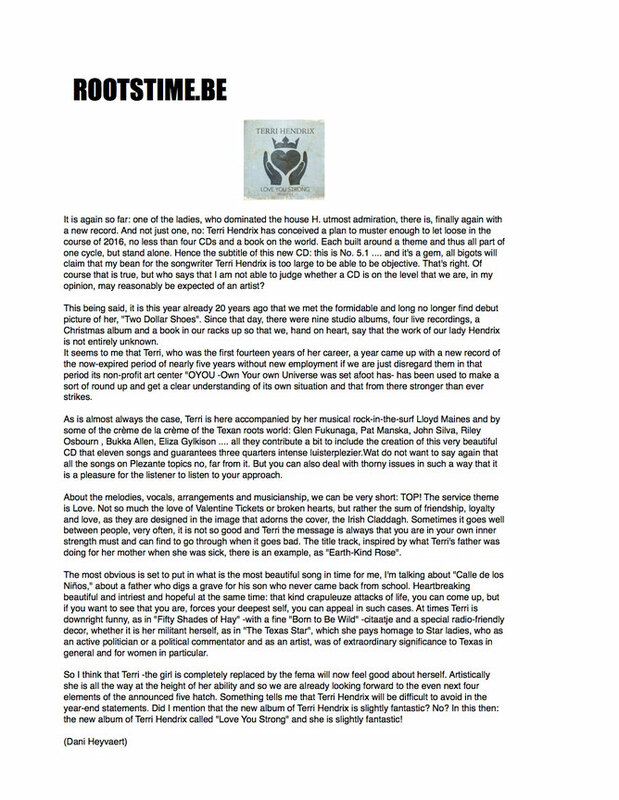 Rootstime.be has been translated to English. 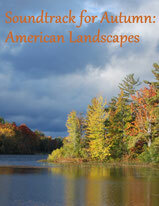 For the original review, please click on image of review.